First you do a tough boot camp workout. Then you have a refueling brunch. Finally, you cap it off with a relaxing 15-minute mini-facial. Breno Donatti — the community-minded owner of Winfield Street Italian Deli — has organized a “Brunch Crunch” for this coming Sunday (February 11). You start at Upper Deck Fitness, next to the ‘Port restaurant. There are 2 time slots — 9 and 9:45 a.m. – to work out in a strength-based group class (all levels welcome). Happy — and hungry — you’ll be ready for an amazing spread of food across the street, courtesy of Winfield Street Deli. They’ll debut a new brunch and coffee menu. Participants can select anything from the revamped menu. Stop 2 of a 3-stop Sunday fun day. It’s $30 a person for the workout and brunch — first come, first served. To register, email info@upperdeckfitness.com, or call 203-329-6231. It’s another $15 for the mini-facial. Pre-registration is required — email info@organachsfarmtoskin.com. Just tell ’em Breno sent you. Beach Stickers: Good For Businesses? Like all Westporters, Bruno Donatti and his wife love Compo. In fact, they love it so much, they run 2.2 miles from their place to the beach — with a stroller and baby on board. It’s nice exercise, and keeps them in shape. Of course, they’d be there more often if they had a beach sticker. The reason they don’t is because they are Westporters during the day only. 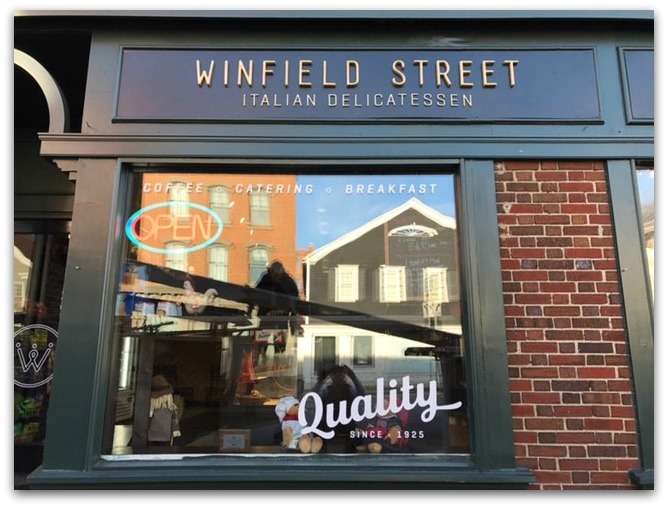 They own 2 fantastic businesses: Winfield Street Italian Deli, just over the Post Road bridge (formerly Art’s), and Winfield Street Coffee, across from the train station. The Winfield Street Deli on Post Road West. Bruno and his staff are fully invested in Westport. They donate to every good cause. They’re part of the community. Their customers love them. So Bruno — who lives with his wife and baby in Stamford — has a good question. He’s looking to buy a house in town. But moving here is not easy. What do you think, “06880” readers? Should business owners be allowed to buy a beach sticker at the Westport rate? Or at a special discounted price? Click “Comments” below. And when you’re done, head to either of Winfield’s locations. They’re worth a detour from anywhere — even the beach.